Bags of gifts and more than $NZ1000 were presented to a group of Iraqi refugees by Holy Land pilgrims from New Zealand when they visited a Melkite church in Amman, Jordan, last month. Fr Gerge Sharayha, the parish priest of St Elias Melkite Greek Catholic Church in Amman, with his son. Melkite Greek Catholic married men may become priests. Elias Melkite (Greek Catholic) parish. The parish cares for more than 100 Chaldean Christian refugees who fled Mosul in Iraq when Isis gave them an ultimatum: convert to Islam, remain as Christians but pay crippling taxes, or leave immediately without any possessions. Before leaving New Zealand, pilgrimage leaders Pat and Suzie McCarthy invited the pilgrims to bring gifts for children or money for refugees. Some involved friends and parishes in collecting items and money. were placed on parish property. appliances such as washing machines. The pilgrims ate lunch with the refugees, several of whom spoke English. 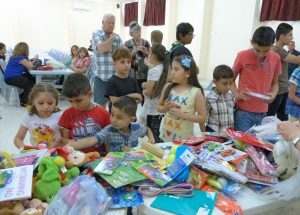 Iraqi refugee children choose gifts donated by New Zealand pilgrims. Tables stacked with toys and other gifts kept the children busy. The children, who had missed a year’s schooling but now attend a local Catholic school, especially liked exercise books and pens and pencils. There were also two birthday cakes. One was for a girl who had been born in Jordan and was just one. The other was for her brother, who was six and born on the same date. been enlivened by the arrival of the refugees with their rich faith. He told of the refugees’ heroic stand for their faith and challenged the New Zealand pilgrims to consider if they would have been prepared to do the same. building a large grotto in the church grounds. In Mosul they had a statue called Our Lady of Deliverance. This one is called Our Lady of Deliverance to Jordan. parish had just learned that five families have been accepted by Australia. The rest are awaiting sponsorship by other countries so they can start new lives. It was great to have you all in Amman-Jordan. Thank you for your love and donations.